Microsoft’s .NET technology has attracted a great deal of press since Beta 1 was first released to the world. Since then, mailing lists, newsgroups, and web sites have sprung up containing a mixture of code samples, applications, and articles of various forms. Even if you’re not a programmer using existing ASP technology, it’s a good bet that you’ve at least heard of .NET, even if you aren’t quite sure what it involves. After all, there’s so much information about .NET, that it’s sometimes hard to filter out what you need from what’s available. With new languages, new designers, and new ways of programming, you might wonder exactly what you need to write ASP.NET applications. We start with the simple discussion of why ASP.NET has come about. As developers, we are all used to the evolutionary cycle of software product releases, where each new release adds a few features and cures a bunch of bugs. Server–side web technology has followed this pattern, with products such as dbWeb and the IDC rapidly settling into the Active Server Pages we know and love today. ASP 1.0 was released in 1996, and although it has gone through a further two releases, it hasn’t really changed that much — until now. Be prepared to throw away many of those ingrained ASP programming habits, as you’ve an interesting ride ahead. ASP.NET is where the revolution begins, because it is radically different from previous versions. Its first appearance into the world was at the Wrox Conference in Washington D.C. back in 1999, where impromptu applause showed how much the audience liked the product. 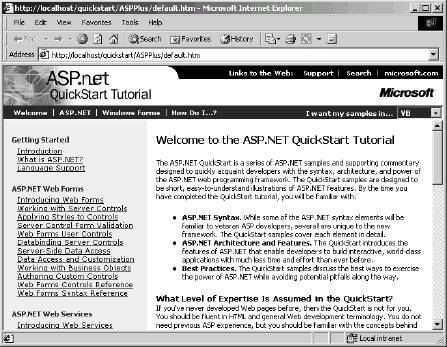 Then in July 2000, ASP.NET received its first public release at PDC, where around 6,000 developers were bombarded with nothing but .NET. As a consequence, they spent most of the week looking like rabbits in headlights — rather dazed and confused with all they had to take in. .NET isn’t particularly difficult to understand, but ASP.NET is very different from what we are used to. That’s really the whole crux of the matter. ASP.NET is just a part of the whole .NET framework, but to use ASP.NET effectively you have to understand the underlying architecture. In the next chapter we’ll outline this new architecture and the benefits it brings, but for now we need to look at ASP.NET. The change to ASP.NET may seem daunting to some, but in the immortal words of Douglas Adams: don’t panic! Even though there’s been a radical change, the basics of ASP.NET are easy to grasp, especially if you’ve only ever programmed in Visual Basic before. Another important point to highlight is that ASP.NET sits alongside ASP — it doesn’t touch existing ASP applications at all. Therefore we don’t have to worry about anything that we’ve previously done suddenly stopping working. 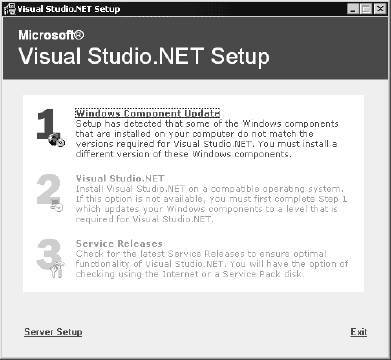 Unlike Beta 2 where there were two versions of ASP.NET, the release version comes in a single version, containing all features. 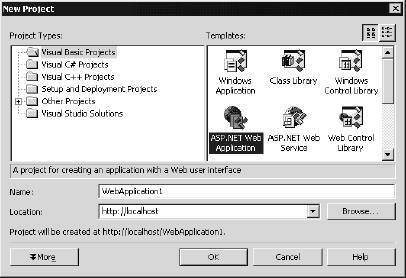 ASP.NET is supported on Windows 2000 (Professional and Server versions), Windows XP, and will be included in Windows .NET Server. It is not supported for Windows NT or the Windows 9x platforms. You can install Visual Studio .NET on these platforms and remotely use ASP.NET on the supported platforms. ASP.NET can be obtained from Microsoft, at http://www.Microsoft.com/net, http://www.asp.net/ or http://www.gotdotnet.com/, and is also part of the MSDN Subscription service. Installation is extremely simple, consisting of a single executable. This installs the framework, including ASP.NET, and includes options for the samples and documentation. During installation you may be asked to update the Microsoft Windows Installer components, and if so, you should click the Yes button to update them. 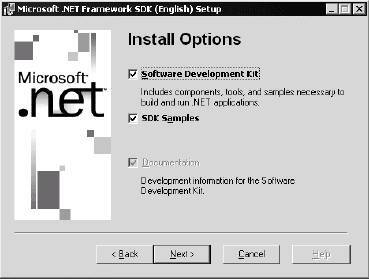 This update is required for the .NET SDK installation. This gives you the options of installing the required components, tools and samples, as well as the SDK samples. You should leave all options ticked to ensure that everything is installed. 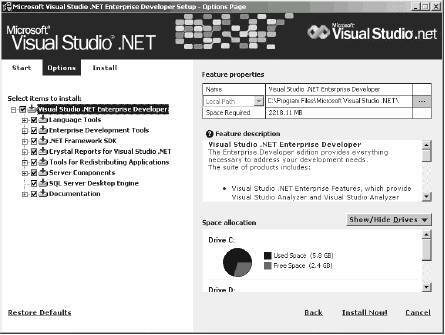 The distributable version of the .NET framework is around 18Mb, and doesn’t contain samples or documentation. As part of the samples, a named instance of the Microsoft Data Engine (MSDE) is installed containing sample databases. Step 1: Install the .NET Framework Samples Database. Click this link and select Run this program from its current location to run the samples database installation routine. If you receive a Security Warning dialog you can select Yes to allow the program to run. At this point the program checks for MSDE, installing it if it isn’t already installed, and then installs the sample databases. Step 2: Set up the QuickStarts. Click this link and select Run this program from its current location to configure IIS and perform other installation routines. You may also receive another Security Warning dialog when you run this program, and you can select Yes to allow the program to run. At this point the samples are installed, and you have the option to Launch them. You can also launch the samples by navigating to the Microsoft .NET Framework SDK menu (installed under the Programs) and selecting Samples and QuickStart Tutorials. We’ll see examples of these topics throughout the book. The right-hand side of the screen will show the samples, including descriptions and sourcecode. The sourcecode for all of the samples is available in Visual Basic, C#, and JScript. The use of these languages is discussed later in the chapter. The sample applications should give you some good ideas of what can be achieved with ASP.NET, as well as showing how it can be achieved and some best practices for writing applications. A Personalized Portal is a sample portal application, allowing user login, content delivery, user preferences, configuration, and so on. 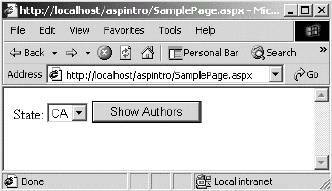 It’s an extremely good example of the use of User Controls, which are reusable ASP.NET pages. An E-Commerce Storefront is a small electronic–commerce site, based around a simple grocery store. It shows some good uses of data binding and templating, and how a shopping basket system could be implemented. A Class Browser Application shows how we can browse through the hierarchy of classes and objects. Not only is this useful from a learning point of view, but it also shows how the classes are queried by run–time code. This is one of the great new features of the framework, and is explained in more detail in the next chapter. IBuySpy.com is another electronic–commerce site, showing more features than the other sample store. It contains user logins, shopping baskets, and so on. www.asp.net is the central site for downloads and links. www.ibuyspy.com is the IBuySpy application online. This code runs online as well as being available as a download (in VB.NET and C#). This site also contains links to a portal based version of IBuySpy, allowing user customization, and a news based version, aimed at content delivery. www.gotdotnet.com is a community site for all .NET developers. It’s full of links and samples by both Microsoft and third parties. This site also has a list of ASP.NET hosting companies. There are also plenty of third party sites, and since this list may change, your best bet is to go to gotdotnet.com and follow the links page. Although this book is primarily aimed at ASP.NET, it is important that we mention Visual Studio .NET as well. The first thing to make clear is that Visual Studio .NET isn’t required to write ASP.NET applications, but it does provides an extremely rich design environment. 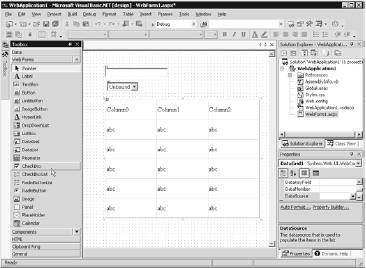 It provides features such as drag and drop for controls, automatic grid and list support, integrated debugging, Intellisense, and so on. The Component Update install allows you to enter a login name and password to be used during the reboots, so that the entire installation can take place without user interaction. Once this step is finished, you have the option of a check for Service Releases, to allow product updates to be automatically downloaded for you. What’s great about this, is that the development environment is the same, whatever the language and application. This dramatically reduces training time, as you don’t have to learn a different tool to do something differently. You can then use View Code (or the more familiar double-click on a control) to see the code for the web page you are creating. We’re not going to go into any more detail on using Visual Studio .NET, as it’s too big a topic and really is outside the scope of this book. What we really want to concentrate on is ASP.NET itself. ODBC .NET Data Provider, which provides access to native ODBC drivers. Mobile Internet Toolkit, to allow development of sites that support mobile devices, such as phones and PDAs. Internet Explorer Web Controls, provide a set of client controls (such as a TreeView and Tab Control) for use in Internet Explorer. Internet Explorer Web Services Behavior. Not all of these are running to the same timeframe as the .NET SDK, but they should all be available from http://www.Microsoft.com/downloads or from MSDN. How is ASP.NET Different from ASP? This question can be answered in one word — very. ASP.NET is not just a new version, but a whole new idea and way of programming web applications. New features weren’t retrofitted into ASP to give us a new version — ASP.NET has been written from the ground up to provide the best possible application framework. This has meant that, in many areas, compatibility with ASP has been broken, but in the long term this is a good thing. It means that ASP.NET provides a much stronger platform for developing applications, and gives many more benefits. If you’re worried about the compatibility issue, then remember we mentioned earlier that ASP.NET runs alongside ASP. Even though there are many differences between the two, installing ASP.NET won’t break existing applications. That’s because your existing ASP pages are still processed by the same mechanism as before, and the new framework processes ASP.NET pages. This is achieved by ASP.NET pages having a new file extension (.aspx), meaning they are not processed in the same way as ASP pages. Compatibility and migration issues are covered in Chapter 23. ASP is a scripted language, relying mainly on VBScript and JScript. Other languages are available if we install an interpreter, but it’s still interpreted. The two disadvantages of interpreted languages are the lack of strong types (as supported by typed languages such as Visual Basic and C/C++), and the lack of a compiled environment. ASP does cache code, but it’s still interpreted, and this inevitably leads to performance and scalability problems. ASP doesn’t provide an inherent structure for applications. In the days of static web pages, we used to see small, focused source files. With the dynamic concept of ASP, it was possible to build code into the web page, again leading to problems. There’s the eternal worry of mixing code and content, which can be a problem if you have a mixed team, with certain people designing the HTML and the interface, with different people doing the coding. Having two sets of people working on the same files is asking for trouble. Another problem was the ability to make the code complex, leading to larger source files. Include files allow a certain amount of structure and code reuse, but it was never really a great solution. We have to write code in ASP to do most things, no matter how simple. For example, consider the task of validating form fields. Just to ensure that values are entered into a field requires code. Other areas such as caching content, maintaining form state, and so on, all require code. Even adding new HTML controls requires writing the raw HTML to the page. The world of browser compatibility has morphed into device compatibility. While the majority of web access still takes place from a PC and browser, how long will that remain the case? Mobile devices are becoming more prevalent, and more powerful, leading to more problems designing sites. If you want your web site to obtain maximum reach you need to contend with these devices, and this means writing code to detect the device and render the appropriate content. Standards compatibility also plays a big part in web development. XHTML is becoming more widely accepted, XML and XSL/T are both now widely used, and talking to mobile devices might also mean support for WML. Support for these standards mean that our ASP applications not only have to work with existing standards, but also be easily upgradeable to support future standards. These are just some of the problems we will encounter when building ASP applications, but they aren’t the only ones. The rapidly changing nature of the Internet often requires rapid changes to applications. For languages that have strong development environments, practices such as componentization, code reuse, rapid development, and so on, are a great boon to a developer, but this sort of support is lacking in ASP. The rise of Business-to-Business applications, and peer-to-peer data sharing also brings great challenges to the developer. ASP.NET was written from the ground up to meet these needs. Not only does it answer many of the questions posed by the existing development environment, but also provides great extensibility, and brings great tool support. At its minimum, all you require is the ASP.NET redistributable, which is freely available, and you can continue to use your favorite editor of choice (come on, admit it — it’s Notepad). This gives us access to everything possible with ASP.NET, including multi-language support. For a richer environment you can use Visual Studio .NET, where you get the drag and drop support, colored code (more useful than you’d think), context sensitive help and tooltips, and all of the usual great editing features that Visual Studio has brought in the past. You may not see some of this support directly, as the Common Language Runtime (CLR) handles much of it. This is discussed in detail in the next chapter, but for now we are going to concentrate on how ASP.NET improves our lives. ASP has been limited to scripting engines, notably VBScript and JScript. The .NET framework inherently supports multiple languages, so we can use whichever we feel most comfortable with. By default the CLR comes with Visual Basic .NET, C#, and JScript .NET (all compiled), and there are a number of third party languages that we can use, such as Perl, COBOL, and many others. Additionally, Visual Studio .NET adds support for Visual C++, and an implementation of Java (called J#) is also available for download from Microsoft. Because this language support is part of the framework, it really doesn’t matter what language you, or others in your team, use. Obviously, from your point of a view, it’s probably best to maintain some degree of compatibility (for maintenance purposes if nothing else), but as far as the framework is concerned, anything goes. This multiple language support isn’t just limited to what’s available, but also to how it’s used. It’s quite possible to write components in one language, and use (or reuse) them from another language. The server based controls are written in C#, but we can quite happily sub-class them from Visual Basic .NET, and then sub-class that control in JScript .NET (or any .NET supported language). The framework is covered in more detail in the next chapter, while Chapter 3 delves into the languages themselves in more detail. If you’ve done some Visual Basic programming, then you’ll find the switch to the new ASP.NET Server Controls fairly painless, but they might cause some initial confusion if your programming has been limited to ASP. There’s no need to worry though, as they are extremely easy to understand and use — it’s just that they are very different from ASP. One of the big problems with ASP is that pages simply define one big function, which started at the top of the page and finished at the bottom. The page content is rendered in the page order, whether it is straight HTML or ASP-generated HTML. Therefore, our logic was dependent upon its position in the page, and there’s no way to target HTML controls except by rendering them as part of the stream. Anything we do requires us to write code, and that includes the output of HTML elements. Making a control run on the server allows us to use the ID attribute to identify it directly. This allows the code to become more readable, since we don’t have to refer to the form contents or copy the contents into variables. It’s also more natural to refer to the control directly, which makes developing pages simpler. If you’ve done any Visual Basic or VBA programming then this won’t seem too alien for you. If you’ve only ever done scripting in ASP, then this may seem strange, but that’s only because it’s a different way of working with content to and from the browser. You’ve probably done database access, so you’ve used objects, called methods, and set properties, and the ASP.NET Server Controls aren’t really any different from this. The new server processing architecture is covered in Chapter 4. Consistency. We are still stuck with the rather non-intuitive nature of some HTML controls. Why for example, is there an INPUT tag for single line text entry, but a TEXTAREA tag for multi-line text entry? Surely a single control where we specify the rows and columns makes more sense? User Experience. How do we easily write sites that render rich content for browsers such as IE, while also preserving compatibility with down level browsers? HTML doesn’t have the ability to change its content depending on the browser — we have to write the code for that. Devices. How do we write sites that cope with devices other than browsers? WAP-Phones, PDAs, and even fridges have browsers nowadays. Like the browser issue, we’d have to manually write code for this. Providing a consistent naming standard. For example, all text entry fields are handled by the TextBox control. For the different modes (multi-line, password, etc.) we just specify attributes. Providing consistent properties. All server controls use a consistent set of properties, making it easier to remember. For example, the Text field of a TextBox is more intuitive than a Value field. Providing a consistent event model. Traditional ASP pages often have large amounts of code handling the posting of data, especially when one page provides multiple commands. With ASP.NET we wire-up controls to event procedures, giving our server-side code more structure. Emitting device specific code. Certain controls will emit HTML when requested by a browser, but WML when requested by a WAP phone. The control handles the detection of the device and the generation of the correct markup. The controls will be covered in detail in later chapters, but let’s take a quick look at a simple example to show how these controls work. Press the button: <asp:Button runat="server" Text="Press Me"
It has the runat="server" attribute set, to tell ASP.NET that it should process this control. It uses the Text attribute to set the text to be shown on the button. This is consistent with other controls. It uses the OnClick attribute to identify the event procedure to be run when the button is clicked. Since this is a server control this event procedure runs on the server. The event procedure is automatically supplied with two parameters — the control that generated the event, and any additional arguments the procedure requires. Within the event procedure we can access any other server controls, including the contents of input fields submitted during a postback. The first is that the form has method, action, and id attributes added automatically. We can add these in ourselves (with the exception of the action attribute) if we want to, but it’s not necessary. A hidden input field is added, which contains (in a compressed form) the state of the server controls. This is called the ViewState, and is how ASP.NET manages the content of the controls. View State is covered in Chapter 4. The Button is converted into a standard submit button. So, we can see that even though we have better code on the server, it doesn’t affect how the code is presented on the client. It’s still standard HTML, with standard forms and elements. HTML Server Controls, which are the server equivalents of the HTML elements. 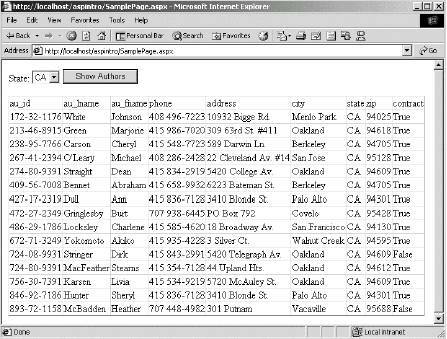 Web Form Controls, which map closely to individual HTML elements. List Controls, which map to groups of HTML elements that produce grids or grid-like layout. Rich Controls, which produce rich content and encapsulate complex functionality, and will output pure HTML or HTML and script. A good example of this is the Calendar control, which provides the user with a calendar from only one line of code. Validation Controls, which are non-visible controls, but allow the easy use of both server-side and client-side form validation. Mobile Controls, which output HTML or WML depending upon the device accessing the page. Chapters 5 and 6 deal extensively with most of these controls, and Chapter 21 covers the Mobile Controls. "Provider=SQLOLEDB; Data Source=. ; Initial Catalog=pubs; UID=sa; PWD="
Response.Write "<td>" & fld.Name & "</td>"
Response.Write "<td>" & fld.Value & "</td>"
Note that you should always close a database connection when you have finished with it. Either call the Close method of the Connection object, or pass the value CommandBehavior.CloseConnection as the parameter to the ExecuteReader method. See Chapter 8 for more details. We can immediately see how there’s much less code to write. In fact, all of the code here relates to getting the data from the database and binding it to the grid. There isn’t any code to create a table as the DataGrid does this. Data binding is covered in Chapter 7. That’s it — nothing extra is needed to get it working. This sort of simplified approach doesn’t mean that the controls are simple, just simple to use. The onus on coding has moved from the web page developer to the control developer. There are also plenty of other non- Microsoft controls, either planned or released, covering everything from more advanced grids to TreeViews. Alternatively you can write your own controls. This is covered in Chapter 18. Use a common set of data types. Are object oriented, and support inheritance. What’s also important is that the language support is built into the Common Language Runtime (CLR), which provides this common support. This means that things such as inheritance are cross-language, so we can write components in C# and inherit and extend them in Visual Basic. The CLR manages all of this for us, as well as providing cross-language debugging, giving such features as being able to use a debugger to step through Visual Basic code in an ASP.NET page into a C# component. What’s also provided is extensibility, meaning that additional languages can be supported. Microsoft supply VB.NET, JScript, and C# as standard with the .NET SDK, but many other languages are being worked on by third parties. I think that this is generally an unused feature of web site design, as many sites are created entirely by programmers. In itself this isn’t a bad thing, but I think programmers in general don’t make great designers, and I count myself firmly in this group. While I’m extremely interested in interface design and usability, I’m not particularly good at it. ASP tended to build on this problem, as the code (ASP script) is, more often than not, intermingled with the content (HTML). This makes it difficult for design and coding to be done at the same time, as well as risking potential problems if updates to the page are required. Press the button: <asp:Button OnClick="btn_Click"
This isn’t that radical a design, but it is a difference from ASP where the <%…%> server blocks are often intermingled with the HTML. Don’t worry about what the code does for the moment, as we’ll be covering that later. What’s important is that all of the script is kept separate from the content. This split is possible in ASP.NET because of the new server control architecture, which allows access to the HTML controls from server-based code. We’ll be looking at this in a moment. Notice that the procedure btn_Click is exactly the same as it was when it was inline. That’s one of the great features of the code behind model; apart from a few directives, the code remains exactly the same. And, since we’re now working in a compiled environment, there’s no performance loss either. Two things govern the configuration of ASP.NET. The first is the standard IIS settings, no different from existing ASP applications. The second is the configuration file, an XML file containing the meta data for our application. There is a machine wide file (machine.config) containing the defaults for all ASP.NET applications, and each application can have its own file (web.config) to override the defaults. The advantage of a file containing configuration information is that we don’t need to touch the registry to modify settings — each application is self-contained. This has an added advantage when we look to deploy an ASP.NET application, because the configuration is just one of the files that we deploy. The configuration files are covered in detail in Chapter 13. Deployment is another area made significantly simpler in ASP.NET, and is generally called XCopy Deployment, for the simple reason that that’s all we generally have to do. Each application is self-contained, including the configuration file and components. In the .NET framework, components no longer require registration, and copying them to their target location is all that’s required. Deployment is covered in detail in Chapter 13. There are exceptions to this model of deployment. One is if we are interacting with COM/COM+ components, which still need to be registered. Another is if we are using Shared Assemblies, where .NET components are being used by more than one ASP.NET application. In this case the component isn’t kept within the same directory as the rest of the ASP.NET files. Interoperability with COM/COM+ is covered in Chapter 23. The first part of this chapter has been a brief overview of some of the differences between ASP and ASP.NET, and Chapter 4 goes into this in more detail. Now it’s time to show you how to get those ASP.NET pages up and running as quickly as possible. Let’s consider a simple form that extracts the author details from the pubs database. We’ll have a drop down list to show the various states where the authors live, a button to fetch the information, and a grid. This will quickly show you several simple techniques you can use in your pages. The first thing to do is decide on where you want to create your own samples. Like ASP we can create a directory under InetPubwwwroot, or create a directory elsewhere and use a Virtual Site or Virtual Directory to point to it. There’s no difference between the methods, it’s purely a matter of preferences. Next you can create your web pages, using whatever editor you prefer. You should give them an extension of .aspx. Now let’s add the code for the sample page — call this SamplePage.aspx (we’ll examine it in more detail after we’ve seen it running). This page assumes that the Pubs database is installed on your system. Here we have a form marked with the runat="server" attribute. This tells ASP.NET that the form will be posting back data for use in server code. Within the form there is a DropDownList (the equivalent of an HTML SELECT list) to contain the states, a Button (equivalent of an HTML INPUT type="button") to postback the data, and a DataGrid to display the authors. The button uses the OnClick event to identify the name of the server-side code to run when the button is pressed. Don’t get confused by thinking this is the client-side, DHTML onClick event, because it’s not. The control is a server-side control (runat="server") and therefore the event will be acted upon within server-side code. Now let’s look at the remaining code, starting with the Import statement. This tells ASP.NET that we are going to use some data access code, in this case code specific to SQL Server. Next comes the actual code, written in Visual Basic. Here is the first real introduction to the event architecture. When a page is loaded, the Page_Load event is raised, and any code within the event procedure is run. In our case, we want to fill the DropDownList with a list of states, so we just manually add them to the list. In reality, this data would probably come from a database. One thing to note about this code is that it is wrapped in an If statement, checking for a Boolean property called IsPostBack. One of the great things about the Web Controls is that they retain their contents across page posts, so we don’t have to refill them. Since the Page_Load event runs every time the page is run, we’d be adding the states to the list that already exists, and the list would keep getting bigger. The IsPostBack property allows us to identify whether or not this is the first time the page has been loaded, or if we have done a post back to the server. Now, when the button is clicked, the associated event procedure is run. This code just builds a SQL statement, fetches the appropriate data, and binds it to the grid. This code isn’t complex, although it may seem confusing at first glance. The rest of the book explains many of these concepts in more detail, but we can easily see some of the benefits. The code is neatly structured, making it easy to write and maintain. Code is broken down into events, and these are only run when invoked. Chapter 4 contains a good discussion of the page events, how they can be used, and the order in which they are raised. What’s also noticeable is that there’s less code to write compared to an equivalent ASP page. This means that we can create applications faster — much of the legwork is done by the controls themselves. What’s also cool about the control architecture is that we can write our own to perform similar tasks. Because the whole of the .NET platform is object based, we can take an existing control and inherit from it, creating our own, slightly modified control. A simple example of this would be a grid within a scrollable region. The supplied grid allows for paging, but not scrolling. ASP is still a great product, and it’s really important to focus on why we had to change, and the benefits it will bring in the long term. Initially there will be some pain as you learn and move towards the .NET architecture, but ultimately your applications will be smaller, faster, and easier to write and maintain. That’s pretty much what most developers want from life. Now it’s time to learn about the .NET Framework itself, and how all of these great features are provided.